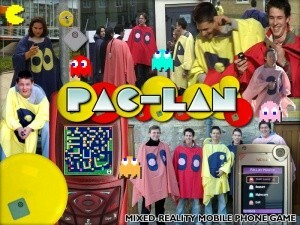 PAC-LAN is a novel version of the video game PACMAN in which human players play the game on a maze based on Alexandra Park at Lancaster University campus. To play the game the PAC-LAN player collects pills using the mobile which are in the form of colored plastic discs containing RFID tags placed around the maze. Four other players take the role of the ghosts who attempt to hunt down the PAC-LAN. A Java application, running on a mobile phone connects PAC-LAN and the Ghosts to a central game server using GPRS.The server relays to PAC-LAN his current position and that of the ghosts based on the pills he has collected. The pills can also be used by the ghosts, not to gain points, but to obtain PAC-LAN’s last known position which will only be updated when they interact with another pill. The ghosts ‘kill’ PAC-LAN by detecting him via RFID on his clothing (or costume). Similarly when PAC-LAN collects a power pill he is then able to kill the ghosts using the same RFID detection process. Dead ghosts must then return to the central point to be reactivated into the game. Points are allocated on pills collected and ghosts killed. The central point is controlled by the server and a special RFID point to ensure ghosts remain immobile until released.